« The Soon-to-be Lost Art of Book Covers? 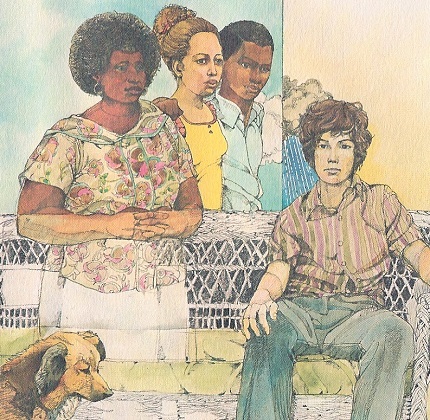 Constantly on the lookout for how people of color have been represented on book covers over the years, and being in the midst of a weeding (for non-librarians, that means getting rid of old books that nobody takes out anymore) project, I came across this one – Garden of Broken Glass by Emily Cheney Neville (Delacorte 1975). Here is a book which does not include “African American” as a subject (most books that include African American characters seem to). Nothing on the jacket mentions African American characters. Yet here they are in this cover illustration by Jerry Pinkney. Remember – this is the 70s. It’s my impression that, in that decade, we were far more advanced in representing people of color on books. Even if – as in this one – the subject matter did not focus on color as subject matter (message: regular people come in all colors). In the glitzy 21st century, are we taking giant steps backward? Garden of Broken Glass uses shifting viewpoints to examine a group of lower-class multicultureal teenagers. Some readers may find Neville’s use of dialect in the novel to be inauthentic, but it remains a thought-provoking book. On the positive side, in this century we (or shall I say – publishers) may have gained sensitivity in the way those characters are represented in the text itself? This entry was posted on August 10, 2010 at 8:43 pm and is filed under book covers, older book covers, people of color, trends. You can follow any responses to this entry through the RSS 2.0 feed. You can leave a response, or trackback from your own site. Yeah, I think it’d be nice to see more books that happen to star people of various cultures, but not have the books actually be about “a person of such-and-such culture who __________.” You know, just have it be the story.